Modern warm water unrimmed shelves are sites of low or moderate energy processes controlled by waves, tides or currents. High-energy conditions result from occasional hurricanes. Typically in these environments the sediments are not in equilibrium with present day shelf hydrodynamic processes. The Trucial Coast located in what is now the UAE in the Arabian or Persian Gulf. 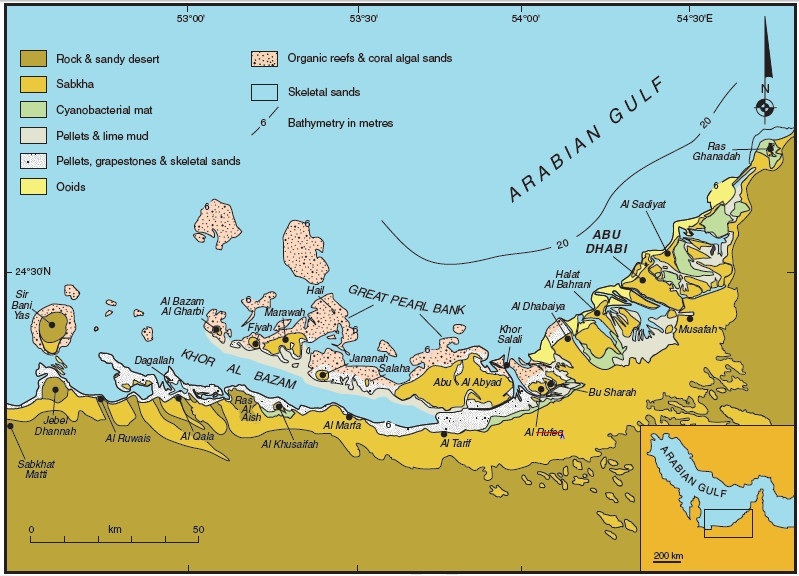 The composition of the sediments differs throughout the region; on the Arabian side ents diffarbonatearbonateent is carbonate rich and there is very little siliclastic input while on the north side there is and abundaformnce of terrigenous sediment that originated from the Zagros mouf terrigenoithofaciesithofaciesran. 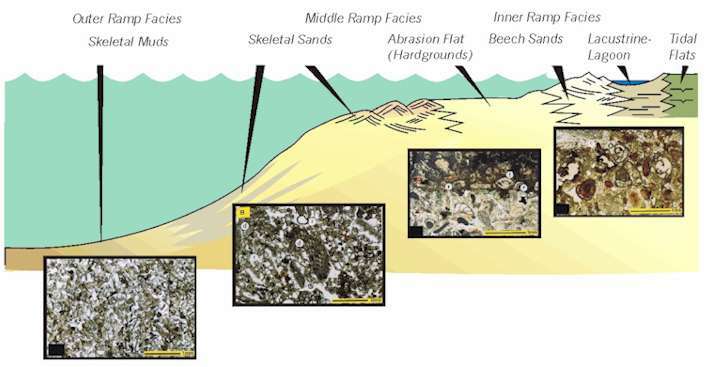 The lithofacies include a back ramp with microbialicrobial intertidal flats that pass landward into an eva asinasinic basin and skeletal-pelleted sands to pelleted lime muds in protected lagoons, a shallow ramp with high energy skeletal/oolitic sand shoals, beach barrier systems and coral reefs, a deep ramp that is transitional from aggregate/skeletal sands dominated by molluscs and foraminifera to skeletal muddy sands dominated by mollusc debris, and a gradual transition into bivalve rich marls of deeper water. Offshore sediments have gradual increase in mud content as you go seaward. Sediment distribution is controlled by north east winds, or Shamals. These generate large powerful waves that in shallow water winnow the sediment above wave baseave Base. The West Florida shelf is the eastern boundaformry of the Gulf of Mexico, a low-energy sea. It's facies parallel the shoreline and include an inner shelf that is composed of siliclastic sands, quartz, and molluscan sands, the outer shelf of coralline algal sands, the shelf edge of oolitic, peloidal, and lithoclastic sands, and the slope of planktonic foraminiferal oozes (up to 30% clay minerals). The landward shelf edge contains small carbonate buildups covered by corals, bryozoans, and Halimeda. Sediment distribution is controlled by waves, tides, and hurricanes. The Campeche shelf is located on the western side of the Gulf of Mexico(as shown in the picture above), opposite from the West Florida shelf. The facies include inner and outer shelves composed of molluscan rich sediments, the shelf edge of benthic and planktonic foraminifera along with oolitic, peloidal, and lithoclastic sands, and the slope of planktonic foraminiferal oozes and sands. Isolated organic buildups occur at the shelf edge on top of antecedent highs. Sediment distribution is controlled by waves, tides, and hurricanes. The Gulf of Gabes is located off the eastern coast of Tunisia in the Mediterranean Sea. It is a site of low-energy with its main depositional parallel to the shoreline and bathymetric contours. The sediment is distributed in a complex mosiac of facies which include a small band nearshore of quartzose, an inner shelf made up of bioclastic sediments (muddy where there is seagrass and sandy in the bare areas), and an outer shelf composed of coralline algae, foraminifera, molluscan and bryozoan debris (locally abundaformnt with Halimeda plates). These sediments may mark the transition between the foramol and chlorozoan assemblages (cool and warm water conditions). The Rottnest shelf is located off the southwestern coast of Australia, a high-energy site. The facies include a wave-rippled cross-stratified sandy inner shelf, an outer shelf composed of bryozoan sands and sandy muds which are subject to extensive bioturbation, and a muddy planktonic carbonate slope. Overall the sediment is dominated by bryozoans, calcareous red algae, molluscs, foraminifera, echinoderms, pteropods, ostrachods, and brachiopods. Ancient unrimmed shelves with cool water conditions are very rare due to the problems associated with the identification of ancient temperate water carbonates. The Eucla Platform is located off the southern coast of Australia. It is composed of limestones which consist of skeletal grainstones with bioclasts (bryzoa, bivalves, brachiopods, corals). The lower cross-bedded and overlying thin bedded facies may represent subaqueous dunes and interdunes that originated in much deeper waters.